Aerosmith guitarist Joe Perry and his Hollywood Vampires bandmate, Johnny Depp, joined the Stone Temple Pilots during their show at The Rose Theatre in Pasadena, CA on March 8, and video from the concert is streaming online. It was DeLeo who discovered Gutt after playing a show in Detroit with the Hollywood Vampires, even though the singer hadn’t submitted an audition tape during the group’s public search for a new frontman. “Thank you to everyone who joined us last night for a very memorable evening with Johnny and Joe,” posted the bassist on social media following the show. 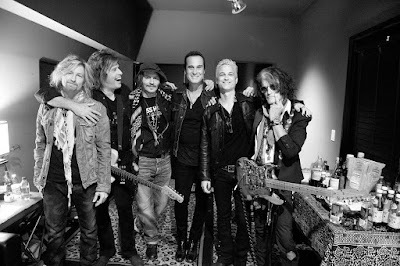 Depp previously joined Stone Temple Pilots for a pair of songs during the tour’s opening night at The Canyon in Santa Clarita, CA on March 2. The Pasadena gig is part of a 2-week spring US trek that will resume next month, with shows currently scheduled into early June.